Human errors contribute to about 94 percent of all traffic accidents in the U.S.1 In many cases, these errors involve the mistakes or poor decisions motorists make behind the wheel. And, increasingly, such poor choices include drivers multitasking behind the wheel and failing to fully pay attention to the road. Elucidating how prevalent, problematic and dangerous distracted driving is in the U.S., below, we have explained the truth about some of the more common myths about this practice. Doing just one other thing while driving isn’t risky – This is completely untrue. When motorists divide their attention between driving any even just one other task, only about 50 percent of their focus will be on the road. Continuing to transition their attention between driving and the other task can – and usually does – end up meaning that drivers miss seeing traffic lights, signs and other important cues necessary for safe driving. Using hands-free devices is not a source of distraction for drivers – This is also completely false. Even if drivers’ hands are on the steering wheel when they are using hands-free devices to talk on the phone, their attention will still be split between their conversation and the task of driving. This is because the conversation – not the fact that a cellphone is being used – is the real source of distraction for motorists. Talking to someone on the phone is just as safe as talking to someone else in the same vehicle – This is also flat-out wrong. In fact, according to research from the University of Utah, talking to someone on a phone while driving is far more dangerous than carrying on a conversation with another passenger in the vehicle. This is because, in general, other passengers can see the road, alert drivers to visual cues they may have missed, and/or alter their conversations (i.e., stop talking) when the driving conditions may be trickier and require more of the motorist’s attention. 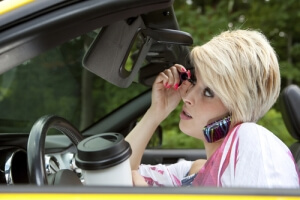 People on the other end of a phone, however, cannot provide this assistance or alter their speech to assist drivers. If you have been injured by a negligent motorist, you can turn to a Denver car accident attorney at Bell & Pollock, P.C. for experienced help advocating your rights and pursuing justice.